Beer Alston Signal Box, as it was originally named, was opened at 220 miles 05 chains mile post mileage from London Waterloo Station on May 12th 1890. Along with the Station, it was renamed Bere Alston on or as from November 18th 1897. The Box then had 17 levers. 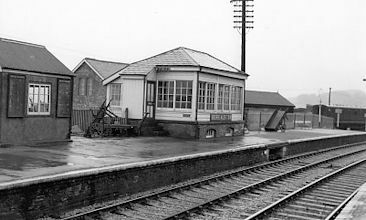 When the Callington Branch was opened on March 2nd 1908 the Branch had its own 4-lever Signal Box and the main one became Bere Alston North Signal Box. The signalling for the Callington Branch was integrated with that of the main line and the number of levers was increased to 30. The extended Box, renamed Bere Alston Signal Box from February 13th 1927, was brought in to use on March 13th 1927. The Box was unable to be switched out. In 1957 Bere Alston Signal Box, which was 6 miles 816 yards from Tavistock North Signal Box, was open on Mondays to Fridays from 5am until 11.30pm; on Saturdays from 5am until 10.36pm; and on Sundays between 8.30am and 1.05pm, 3pm until 7.55pm, and 9.25pm until 10.25pm. The Box was provided with a closing switch. Bere Alston Signal Box was closed on or as from September 7th 1970 and replaced by a Ground Frame for use in reversing the present Plymouth Station to Gunnislake Station branch trains.